So now that Besiege allows the use of custom Skin Packs to replace the vanilla textures and models of blocks, we thought it would be a good idea to create a simple guide explaining how it all works. All you have to do then is copy your models and or textures into the folder of the block you wish to replace. Step 3. Load up the game, enter a level and make sure that the 'Skins' option is turned on in the panel where the god tools are located. This option should turn on by default when you add a skin pack to the game but check just to make sure. Step 4. Double clicking on a block will now open a small menu from which you can select the skin you wish to use on the next block you place. If you would like to apply a skin to all the blocks on your machine, that are this type, then click the little cog icon. Clicking the cog will open the 'Skin Packs' management display, then all you need to do is hover over the pack you want to apply and select the paint bucket icon to apply it to your machine's blocks. And that's it! Your done! Saving your machine will also save the skins that you are using. Note that this does not mean that the skins will be included in the save file, it only means that the save file remembers which skins it should be using. 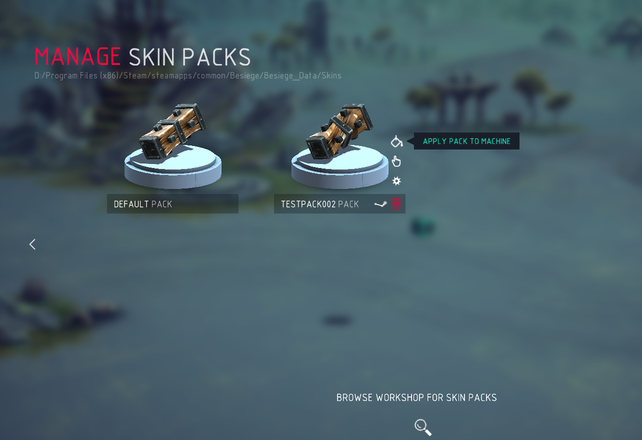 Unfortunately we don't have a detailed guide for you on how to create skin packs for Besiege, but we do have some basic information which should help you figure it out! We do hope to publish a video after the update which will hopefully make things a little easier to follow. The first thing to note is that you don't have to have a custom model and texture, you can just add a texture and it will be applied to the vanilla model. Likewise you can just add a custom model and the vanilla texture will be applied to it. - Textures should be kept in a square format and preferably match binary, for example 256x256, 512x512, 1024x1024, etc. - Models should be have 250-1000 triangles (tris), with 1000 being a highly detailed or large model. We highly recommend that you use Blender for the creation of your models, its a bit of software and easy to get to grips with. Please also note that packs named "Template" will never be loaded by the game. Wow besiege will be so customizable now! I can draw textures for skins but not model, I'm wondering if you can give us the template for the default texture? wait does this mean v0.3 is out? Not quite! Hopefully very soon! Uh, is it just me or if you download too many skin packs from the workshop, besiege only crashes when loading? Since it has to load all the skins into memory, having too many downloaded will use up your allocated ram. I'm using non steam version. Where can I get the skins? Hey! A skins page! Nice! Is there any way that I can change the skin of all of the parts on an already built machine?